My son is now 6 and for the last year has found he loves to kick around a football. I guess that goes for most boys and girls around the same age really but recently we have been talking about whether to sign him up for lessons with locally. We know he would absolutely love it however as with all sports and clubs it comes with both pros and cons. Football involves running, sprinting and skills which require generous energy expenditure and engage the cardiovascular system. Regularly participating in aerobic exercise such as football offers many long-term health benefits such as increased longevity, as well as reduced susceptibility to heart disease, osteoporosis and other chronic diseases. Football helps develop numerous types of fitness skills including speed, agility and power. Players may lose body fat and gain lean muscle. Football players also develop muscle strength through conditioning exercises and increase power by tackling and defensive moves. Other advantages of football include increased muscular endurance, improved flexibly and mobility. 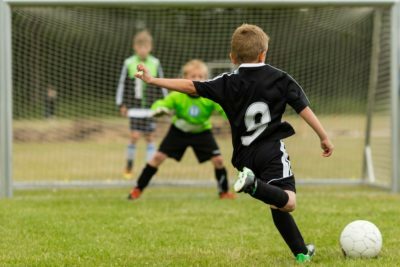 Leaning the rules of the game and adhering to the football coaches instruction teaches children discipline and helps to boost their emotional development. The competitive nature of the game helps the players learn how to deal with disappointment, helps them to develop resilience, practice good sportsmanship and learn how to grow from constructive criticism. Football can also instil confidence and self-esteem, and help players overcome shyness. Competitive sports also help to teach teamwork, selflessness, cooperation and better communication skills. It also helps to instil life skills which are important for later on in life such as leadership, turn-taking, goal-setting and time management. One of the major disadvantages of playing football is the high risk of injury. As with any sport even when all safety precautions are followed to the letter, scrapes, bruises, sprains, joint dislocations, broken bones and concussions are all a possibility. Another disadvantage to playing football is that the sport requires a significant commitment of time. There are not only the training days every week, but there are also match days both home and away, and many other commitments as you progress through the years such as uk football tours and tournaments. Of course, these time commitments are not only for the children but for their parents too – and they play in all weather conditions rain or shine and to be completely honest as much as I am an all-weather parent and believe there is no such thing as bad weather, only inappropriate clothing I’m not sure I am really up for standing at the side of the pitch in freezing cold or rainy conditions. The is also the cost to consider too, the list of items they need becomes endless, especially at the rate children grow out of things. There are the club fees, football kit, football boots, shin pads, mouth guards and some clubs also charge match fees – then, of course, there are the travel fees associated with getting to away matches etc. Now having read all that back I think we will put it off for a few years and wait to see if he loves it as much when he starts playing at school. If he does then still want to join we will book him in then. I would agree with you, I would never discourage extra curricular clubs, but it’s their choice, if they’re interested and ask to go, they go, if not, they don’t, and they’re aware that’s how it works, I’m not a mind-reader! You have to encourage children to run around and keep fit and I enjoy taking my grandchildren to play football in a nearby Rugby club but time and commitment is a downside with a club!